The local grocery stores have started stocking fresh cranberries so I am taking advantage of it and creating cranberry recipes. These delicious cookies are made by starting with a basic snickerdoodle recipe. 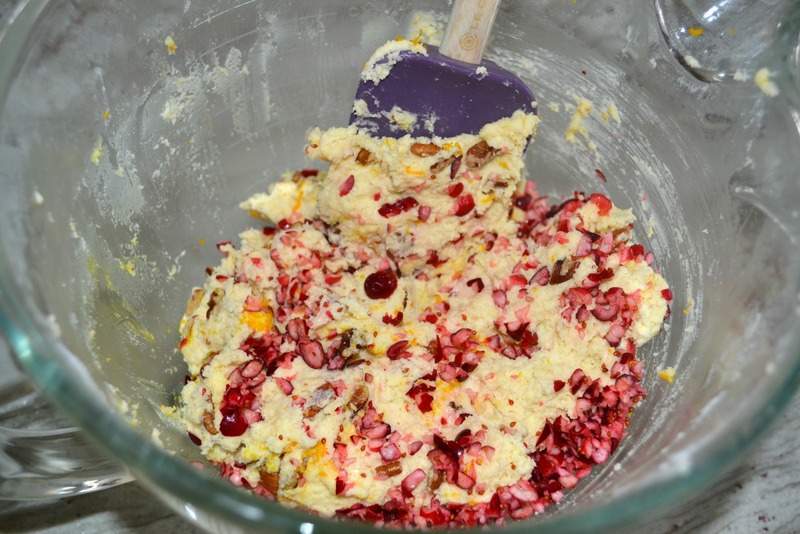 I added fresh cranberries, orange zest, and pecans to the dough. After they are baked, dip in melted white chocolate and allow the chocolate to harden. My husband and I really only started eating cranberries about 3 years ago. I always throw a few bags in the freezer to use during the year when I cannot get them. They are delicious in Turkey Meatloaf and make it extra moist. I also make a cranberry sauce that we eat on turkey paninis, club sandwiches, and we love them in stuffing. The desserts are endless they can be used in. What are some ways you use fresh cranberries? I would love more ideas.. 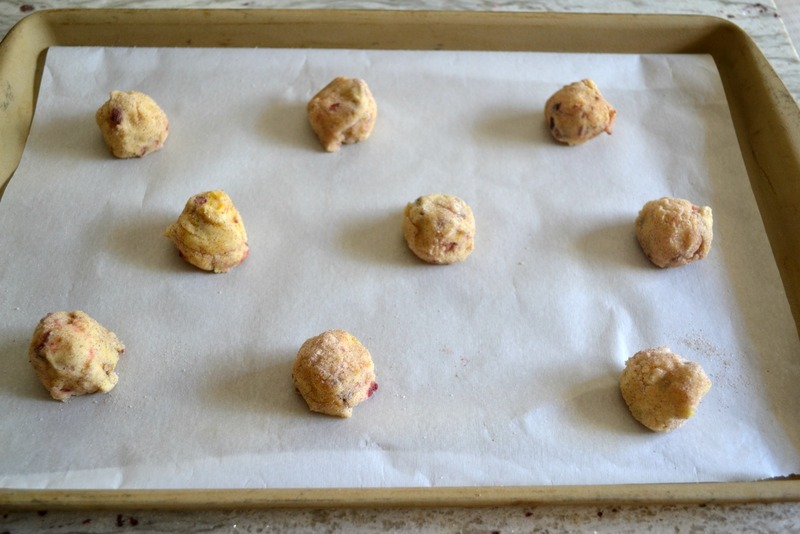 Mix up the snickerdoodle recipe, then stir in fresh chopped cranberries, orange zest and pecans. Shape the dough into balls, roll in the cinnamon-sugar mixture and then bake. 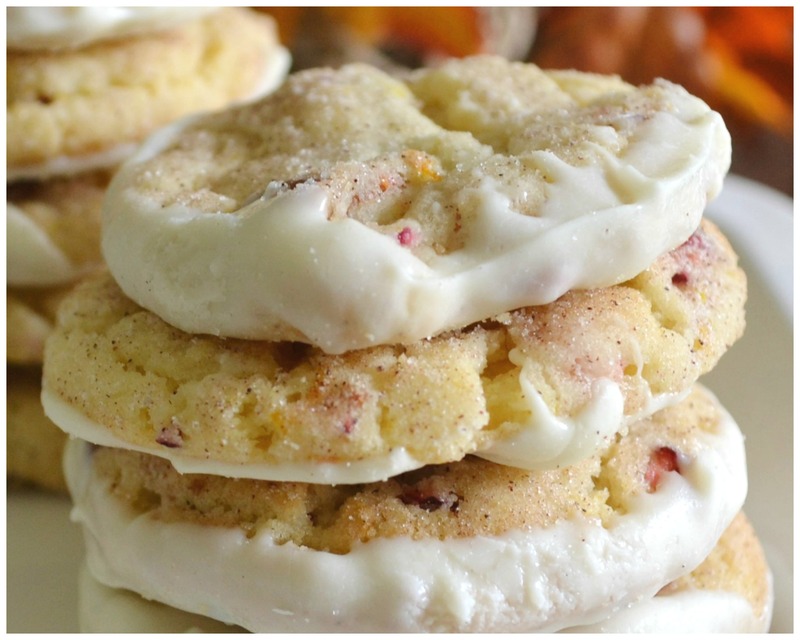 Melt white chocolate baking discs to dip the cookies in. I did the bottom of these, but you can also just hold the cookie and dip a side of it in the chocolate. I also use Ghiradelli’s . In a large mixing bowl, whisk together the flour, cream of tartar, soda, and salt: set aside. In another large mixing bowl, cream the butter and shortening together, using an electric mixer. Add 1 1/2 cups sugar and the eggs, continue to mix until well combined. Combine the cinnamon to the remaining sugar in a small bowl and set aside. Gradually add the flour mixture to butter mixture, in 3 divided amounts, mix only until combined. Stir in the cranberries, orange zest, and pecans. Shape dough into 1 1/2 inch size balls, using a teaspoon or small scoop. Roll each ball in the cinnamon-sugar mixture and place on cookie sheets 2 inches apart. Bake for 9-11 minutes or until edges are light golden brown. Remove cookies from the oven and allow to set on pans about 5 minutes. Transfer cookies to a wire cooling rack. Place the white chocolate and oil into a medium size, microwave safe bowl. Microwave for 40 seconds and stir. Continue to microwave at 20 second intervals, stirring after each, until chocolate is melted and smooth. Hold each cookie bottom in the melted chocolate, allow excess to drip off, then return to cooling rack with chocolate side up. Allow cookies to cool until the white chocolate hardens before placing on serving tray or packing. I Pinned it to try later. Looks really yummy! Those cookies look yummy. I am not a big fan of cranberries and didn’t like them at all until about 5 years ago when I first cooked them from scratch and didn’t serve them from a can! Oh my! Such a difference. I will have to try out your cookies. Cranberries are supposed to be a super food so that makes the cookies healthy, right?! Thank you. I agree that the fresh cranberries are much better than the can. I use the Snickerdoodles recipe often and do add ins. Dried blueberries are great. Thank you. I think cranberry & orange really is a great combination. The snickerdoodles look amazing. I printed it off and saving it for Christmas holidays! Thank you. Thank you. It will be holiday baking time before we know it. 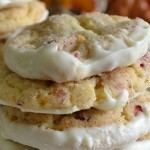 I have a stack of cookie recipes from others to try this year also. I discovered an easy cranberry sauce recipe that I use every Thanksgiving. Other than that, the grandkids and I string them with popcorn to feed the birds! These look delicious. I must try them. I never thought to use cranberries in meatloaf….hmmm. Thank you Krista. The cranberries in the meatloaf makes it moist and gives a little tangy taste. I don’t even remember why I started using them in it…must have seen it in a magazine or on TV. You are determined to fatten us all up! Now I need cookies! I figured since I eat too many, I may as well have some company! Love a good snickerdoodle and this combination has me very intrigued with the flavor combination. Thanks for linking up with Blogging Grandmothers. 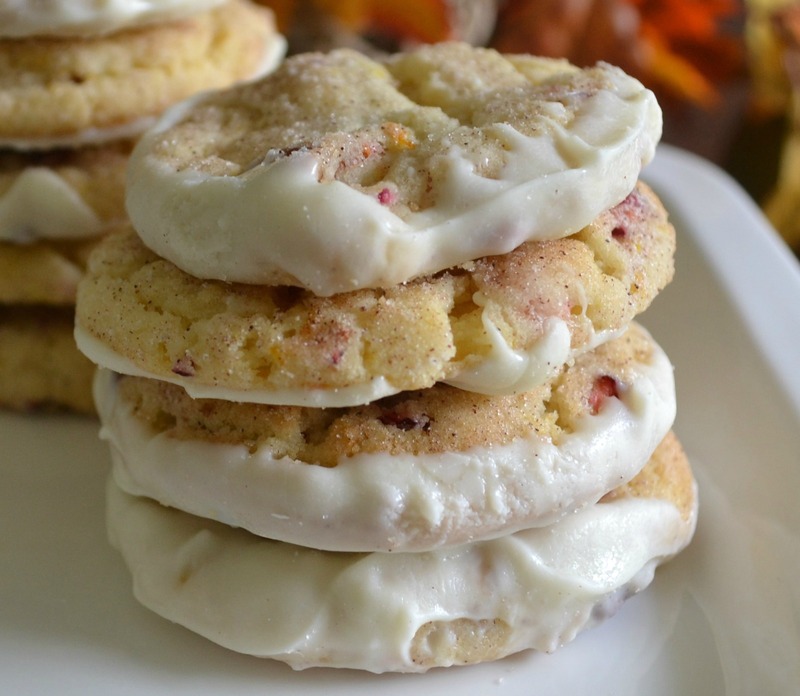 I love cranberries and these cookies look tasty. Never had turkey meatloaf. 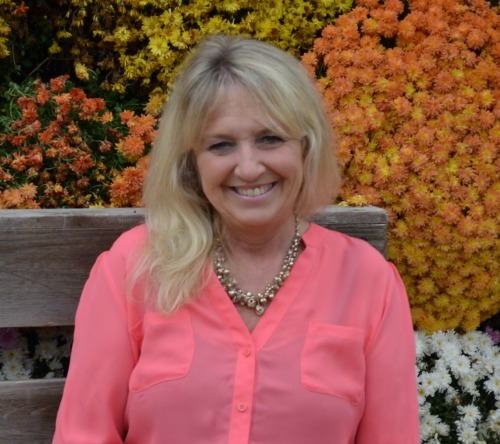 Thank you Pamela for sharing at #BloggingGrandmothers #LinkUp #BlogParty. I shared on social media. This recipe looks so good and I love crandberries. This is quite a combination. I am pinning to make sure I try later. Thank you for sharing with #blogginggrandmothers. I have shared on my social media. Just added these to my Christmas cookie baking list! They look amazing!